Fibrillary GN (FGN) is a rare primary glomerular disease. 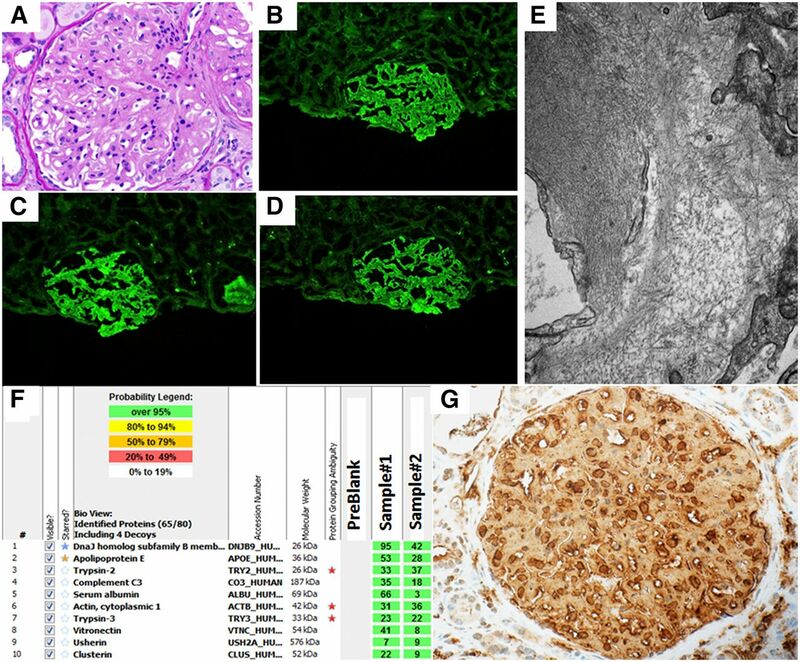 Histologic and histochemical features of FGN overlap with those of other glomerular diseases, and no unique histologic biomarkers for diagnosing FGN have been identified. We analyzed the proteomic content of glomeruli in patient biopsy specimens and detected DnaJ heat shock protein family (Hsp40) member B9 (DNAJB9) as the fourth most abundant protein in FGN glomeruli. Compared with amyloidosis glomeruli, FGN glomeruli exhibited a >6-fold overexpression of DNAJB9 protein. Sanger sequencing and protein sequence coverage maps showed that the DNAJB9 protein deposited in FGN glomeruli did not have any major sequence or structural alterations. 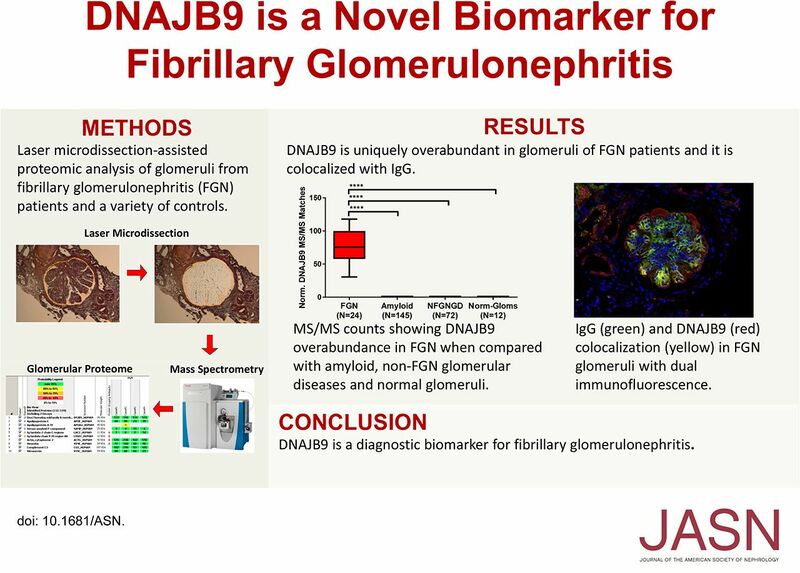 Notably, we detected DNAJB9 in all patients with FGN but not in healthy glomeruli or in 19 types of non-FGN glomerular diseases. We also observed the codeposition of DNAJB9 and Ig-γ. Overall, these findings indicate that DNAJB9 is an FGN marker with 100% sensitivity and 100% specificity. The magnitude and specificity of DNAJB9 overabundance in FGN also suggests that this protein has a role in FGN pathogenesis. With this evidence, we propose that DNAJB9 is a strong biomarker for rapid diagnosis of FGN in renal biopsy specimens. Fibrillary GN (FGN) is a rare glomerular disease seen in 0.5%–1% of native kidney biopsy specimens.1,2 Patients with FGN present with proteinuria, hematuria, renal impairment, and hypertension. Most cases are idiopathic,1–4 although a third of the cases occur in association with hepatitis C infection, dysproteinemia, or autoimmune diseases.4,5 FGN has a poor prognosis, with nearly 50% of patients progressing to ESRD within 4 years despite therapeutic interventions.4 The pathogenesis of FGN is unknown. Traditionally, an FGN diagnosis relies on integrating ultrastructural, immunofluorescence (IF), and light microscopic (LM) findings. These include detection of haphazardly arranged, straight fibrils measuring 10–30 nm in thickness in the mesangium and/or along the glomerular basement membranes by electron microscopy (EM). The deposits are Congo red (CR) negative, distinguishing FGN from amyloidosis. IF in a typical patient with FGN shows smudgy glomerular staining for IgG (γ), both κ and λ light chains, and C3. LM demonstrates mesangial expansion/hypercellularity with or without duplication of the glomerular basement membranes. To date, there is no unique biomarker for diagnosing FGN. FGN subcohort (n=24). Supplemental Table 1 shows the salient clinical characteristics and pathologic findings of these patients. Non-FGN glomerular disease subcohort (NFGNGD; n=72 including: n=13 dense deposit disease, n=7 C3 GN, n=5 anti-GBM nephritis, n=5 bacterial infection–associated GN, n=5 pauci-immune crescentic GN, n=5 transplant glomerulopathy, n=5 immunotactoid GN, n=5 fibronectin glomerulopathy, n=4 lupus nephritis class IV and V, n=4 cryoglobulinemic GN, n=2 lupus nephritis class IV, n=2 diabetic glomerulosclerosis, n=2 glomerular thrombotic microangiopathy, n=2 membranous nephropathy, n=2 proliferative GN with monoclonal IgG deposits, n=2 Ig γ heavy chain deposition disease, and n=2 IgA nephropathy). All of the diagnoses in this group were established following standard clinical and pathologic criteria. The FGN proteome has never been definitively determined. Hence, we wanted to assess whether FGN glomeruli contain unique protein expression patterns that could provide specific diagnostic biomarkers and/or clues to the pathogenesis of FGN. To accomplish this, we used laser microdissection (LMD) to extract glomeruli from formalin-fixed paraffin-embedded (FFPE) biopsy samples obtained from patients with FGN, renal amyloidosis, and NFGNGD and healthy subjects. Proteins present in the dissections were analyzed using liquid chromatography–assisted tandem mass spectrometry (LC-MS/MS) and identified using a previously published bioinformatics pipeline.7 We used QuasiTel8 software to normalize the protein spectral counts found in the FGN and amyloidosis samples and to perform differential expression analysis. We detected DNAJB9 (DnaJ Heat Shock Protein Family [Hsp40] Member B9) as the fourth most abundant protein (by normalized spectral counts) in FGN glomeruli (Supplemental Table 2). Table 1 presents a list of proteins that were overabundant in the FGN cohort when compared with the amyloidosis cohort. DNAJB9 was the top most overabundant protein in FGN glomeruli when compared with amyloidosis glomeruli (FDR corrected P value=3.79E−286 and log2[fold change]=6.68). We also detected an overabundance of complement factor proteins in FGN glomeruli when compared with renal amyloidosis (Table 1), consistent with the IF findings in FGN. A pathway analysis with proteins that were overabundant in FGN glomeruli showed that these proteins are involved in activation and regulation of the C3 and C5 complement cascade (Supplemental Table 3). We did not detect differential abundance of Ig light chains in FGN glomeruli when compared with amyloidosis because approximately 60% of the renal amyloidosis samples were of AL type. However, a separate differential expression analysis comparing FGN and healthy glomeruli samples showed overabundance of Ig-γ, Ig-κ, and Ig-λ in FGN glomeruli (data not shown), which is another known feature of FGN. This proteomic confirmation of known FGN molecular features lends technical credibility for the mass spectrometry method to detect meaningful protein changes that are present in the FGN glomeruli. Figure 1A shows a composite protein identification report in representative samples from all four subcohorts (FGN, healthy, renal amyloidosis, and NFGNGD). DNAJB9 was only detected in the patients with FGN. The peptides detected for DNAJB9 were distributed across the entire length of the mature protein (Figure 1B, showing sequence coverage of the protein in patient #3). This result indicates that full-length protein was detected in the FGN glomeruli (i.e., there were no truncations). DNAJB9 was exclusively present in the FGN samples and was not detectable in normal, amyloidosis, and NFGNGD samples (Figure 1C). This supports the hypothesis that DNAJB9 can distinguish between FGN and its mimics like amyloidosis, immunotactoid glomerulopathy,1,2,9,10 and lupus nephritis.9 Taken together, these data indicate that FGN glomeruli contain overabundant DNAJB9 and its presence can serve as a specific diagnostic biomarker for FGN in renal biopsy samples. Proteomics identifies DNAJB9 as an FGN-specific tissue marker. (A) Proteins codeposited with amyloids of all types are highlighted with blue stars. Proteins highlighted with yellow stars are AL type specific markers. DNAJB9 protein was highlighted with a double star. Numbers in the boxes show the total number of MS/MS matched to the protein in a sample. (B) Portions of the DNAJB9 amino acid sequence detected in patient #3 were highlighted with bold black letters on yellow background. The first 23 amino acids represent the signal peptide and are absent from the mature protein. Amino acids highlighted in green are post-translational modifications due to sample handling (oxidation of methionine and formation of pyroglutamate from N-terminal glutamine). (C) “Amyloid” represents renal amyloidosis types listed in the text. “NFGNGD” represents non-FGN glomerular diseases listed in the text. “Norm-Gloms” represents healthy glomerulus samples. ****Mann–Whitney U rank sum test P ≤0.001. AL, light chain amyloidosis; MS/MS, tandem mass spectrum; Nom., normal. Figure 2 demonstrates glomerular deposition of DNAJB9 using immunohistochemistry (IHC), and Ig-γ heavy chain, and Ig-κ and Ig-λ light chains, using IF in a patient with FGN. LM showed glomerular mesangial hypercellularity and expansion (Figure 2A). IF showed global smudgy mesangial and glomerular capillary wall staining for Ig-γ (Figure 2B), Ig-κ (Figure 2C), and Ig-λ (Figure 2D). EM showed glomerular randomly oriented fibrils (Figure 2E). The overabundance of DNAJB9 in glomeruli was detected by both proteomics (Figure 2F) and IHC (Figure 2G). An amyloidosis diagnosis was excluded because the deposits were CR negative (not shown) and we did not detect all three of the typical biomarkers commonly codeposited with amyloids of all types11 (Figure 2F). We also performed an IF dual stain for Ig-γ and DNAJB9 in an FFPE FGN case, which showed colocalization of DNAJB9 in a pattern that is consistent with IgG deposition in FGN (Figure 3). These data suggest that overabundant DNAJB9 in FGN glomeruli is deposited extracellularly and the immune complexes that are observed in patients with FGN are colocalized with DNJAB9. 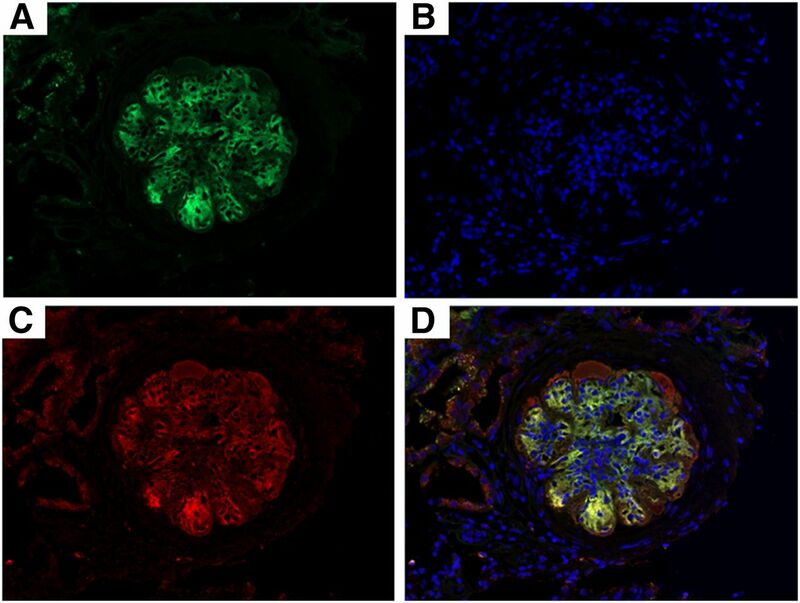 Glomerular deposition of DNAJB9 and immune complexes in a patient with FGN. This figure is from the biopsy sample of patient #7 in Supplemental Table 1. (A) PAS stain shows glomerular mesangial hypercellularity and expansion. IF shows global smudgy mesangial and glomerular capillary wall staining for IgG (B), κ light chain (C), and λ light chain (D). (E) Electron micrograph shows randomly oriented fibrils expanding the glomerular basement membrane. 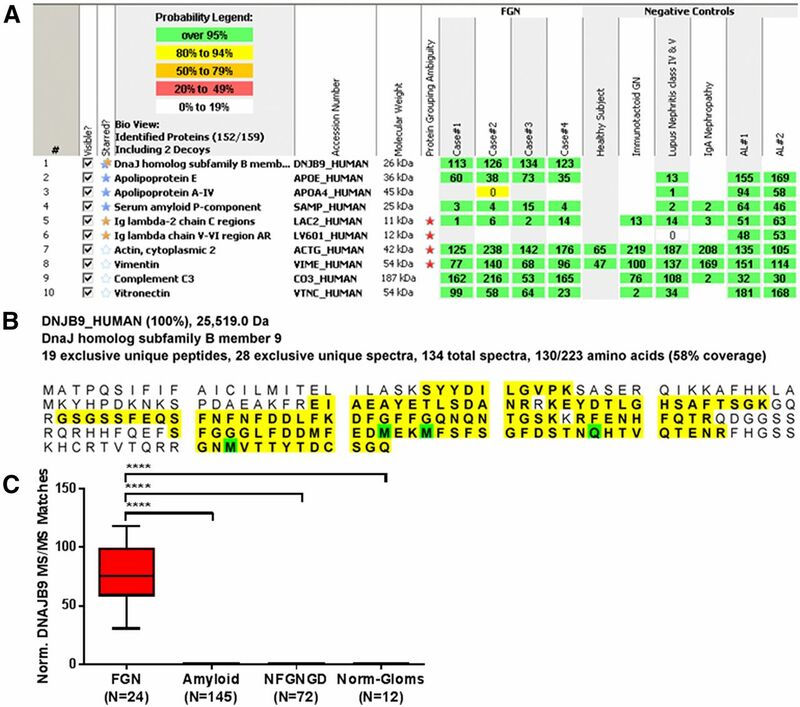 (F) Proteomic analysis of the laser microdissected glomeruli shows expression of DNAJB9 protein and lack of universal amyloid tissue markers (APOE, APOA4, and SAP). Replicate dissections were performed for the patient. PreBlank refers to a blank LC-MS/MS run that ensures data integrity. (G) IHC shows bright smudgy global mesangial and glomerular capillary wall staining for DNAJB9. Original magnification is ×400 for (A) and (G), ×200 for (B) and (C), and ×21,000 for (E). Supplemental Figure 2 shows the staining specificity of the DNAJB9 antibody used for IHC. DNAJB9 and IgG dual IF showing colocalization. A single FFPE section from a patient with FGN in the cohort was used to stain for IgG (green) and DNAJB9 (red) in order to show their colocalization. IF utilized the same DNAJB9 primary antibody that was validated for IHC (Supplemental Figure 2). (A) Green channel showing IgG, (B) red channel showing DNAJB9, and (C) blue channel showing Hoechst 33342 staining of the nuclei. (D) Merged DNAJB9 and IgG shows colocalization of DNAJB9 in a pattern similar to that of IgG. Original magnification for all panels was ×20. There are few case reports of familial FGN in humans.12,13 We wanted to check for the possibility that DNAJB9 genetic alterations could potentially lead to the pathogenesis of FGN. For this, DNA was isolated from two subjects in the FGN subcohort and the DNAJB9 gene was sequenced using Sanger sequencing. We did not detect any pathogenic mutations in either of the patients. One of the patients had a single nucleotide polymorphism resulting in a synonymous amino acid change (Supplemental Figure 1). These results lend support to the hypothesis that mutant DNAJB9 is unlikely to be the cause of FGN. However, extensive epidemiologic studies would be required to definitively address this question; that task is out of scope of this study. The histologic and histochemical features of FGN overlap with those of other glomerular diseases. Further, there are no descriptions of a single, specific biomarker that can distinguish FGN from other entities in the differential diagnosis. Hence, in current clinical practice, an integrated diagnostic approach combining histology, IF, and ultrastructural features is used to diagnose FGN. Our discovery of DNAJB9 overabundance in FGN glomeruli, but not in other non-FGN glomerular diseases or in healthy glomeruli, is likely to prove extremely valuable in simplifying the diagnostic algorithms for FGN. For example, for routine practices where mass spectrometry is unavailable, IHC for DNAJB9 could be developed and validated to provide a practical ancillary test for the diagnosis of FGN. FGN is treated with immunosuppressive therapy with limited success. Hogan et al.14 observed that rituximab therapy was associated with nonprogression of FGN in only a third of the 12 patients studied. Other researchers have observed similar limited gains with immunosuppressive therapy in patients with FGN.15,16 To date, there is no curative, targeted therapy for FGN. This is primarily because the precise molecular cause of FGN is unknown. The overabundance and extracellular codeposition of DNAJB9 with Ig light and heavy chains in FGN glomeruli indicates that DNAJB9 is likely to be a key feature in the pathogenesis of FGN. Therapies that target this particular protein may result in better outcomes for patients with FGN. For instance, Lee et al.17 recently showed that DNAJB9 is a negative regulator of p53 and is induced by the Ras/Raf/ERK pathway in response to p53 induction. Hence, Ras/Raf/ERK inhibitors might be effective in reducing the overabundance of DNAJB9 observed in FGN glomeruli. However, the exact mechanism by which DNAJB9 is induced in FGN is still unknown and needs further study. Despite this, we believe that the discovery of DNAJB9 as a unique molecular feature of FGN is a solid first step toward improving the clinical care of these patients. All diagnoses were made using standard pathologic review of renal cortex and medulla of the FFPE renal biopsy tissues. Hematoxylin and eosin–stained FFPE sections were examined using LM. CR stain was performed on the FFPE sections following a standard protocol and apple-green birefringence was evaluated with polarized LM. IF for Ig-γ, Ig-α, Ig-μ, Ig-κ, Ig-λ, C3, and C1q was performed on frozen sections and in selected cases on pronase-treated paraffin sections using standard techniques. Standard processing was also used for EM. All FGN cases included in this study fulfilled the following previously established diagnostic criteria4: glomerular deposition of fibrils that were (1) randomly-oriented; (2) lacked hollow centers at magnification of <30,000; (3) were Congo-red negative; and (4) stained with antisera to Igs by IF. We used a previously established proteomics method for characterizing the glomerular proteomes.6 In brief, for amyloid tissues, CR-stained FFPE tissue sections for each patient were mounted on a Director slide (Nantomics, Rockville, MD) and examined for presence of amyloid in glomeruli. Stained slides were loaded on an LMD apparatus (Lieca, Wetzlar, Germany) and glomeruli were visualized under fluorescent light for dissection. For nonamyloid tissues, hematoxylin and eosin–stained slides were loaded on an LMD apparatus and glomeruli were visualized under bright field. Multiple independent dissections (replicates), each configured to capture material from an area of 60,000 μM,2 were performed for each patient. Material from each replicate dissection was captured in a tube containing 35 μl of Tris/EDTA/0.002% Zwittergent buffer. Proteins were extracted from the captured FFPE fragments using heat and sonication. Extracted proteins were digested with trypsin and resulting peptides were analyzed on an QExactive mass spectrometer (Thermo Fisher Scientific, Waltham, MA), an LTQ-Velos mass spectrometer (Thermo Fisher Scientific), or an LTQ-Orbitrap mass spectrometer (Thermo Fisher Scientific) using LC-MS/MS. We used a previously published bioinformatics pipeline for processing all of the LC-MS/MS data.7 In brief, LC-MS/MS data from each patient sample were analyzed using multiple database search engines configured to match MS/MS against a composite protein sequence database containing SwissProt human proteome (downloaded 08/2012) and common contaminants (e.g., wool, etc.). Reversed protein sequences were used to estimate false discovery rates. The search engines were configured to derive tryptic peptides from the sequence database and look for the following variable modifications: oxidation of methionine (+15.994 D) and formation of N-terminal pyroglutamic acid (−17.023 D). Scaffold software processed the results and assembled protein identifications with at least two confident (identification P>0.9) and unique peptide matches. For amyloid samples, a pathologist scrutinized the profile for an amyloid confirming universal molecular signature (APOE, SAP, and APOA4)11 and assigned the type on the basis of the most abundant amyloidogenic protein18 (by spectral counts) that was consistently detected in all replicate dissections.6,7,11 The proteome profiles of the rest of the cohorts were also reviewed by a pathologist. LC-MS/MS data from FGN and amyloid cohort samples were subjected to differential expression analysis in order to find proteomic differences. For this, Scaffold software exported the number of MS/MS spectra matched to a protein as a semiquantitative measure of its abundance.19 QuasiTel software was modified to read the Scaffold protein exports and perform differential expression of proteins by using a quasi-likelihood–based generalized linear mixture model.8 The software automatically normalizes the protein spectral counts present in each sample to account for protein loading differences between LC-MS/MS experiments. Proteins with a corrected differential expression P value of ≤0.05 and an absolute fold change ≥1.0 (where 0.0 signifies no change) were considered as significantly differentially expressed between the FGN discovery and amyloid cohorts. Slides were stained with an anti-DNAJB9 rabbit polyclonal antibody (cat# HPA040967; 1/75 titer; Sigma-Aldrich, St. Louis, MO) on a Ventana BenchMark XT system using Ventana OptiView Universal DAB Detection and OptiView Amplification Kits. All antigen retrieval and staining steps were performed on a Leica Bond RX stainer (Leica). Four-micrometer-thick sections were obtained from the FFPE tissue blocks and mounted on standard IF slides. Slides were retrieved for 5 minutes using Enzyme 2 pretreatment kit (Leica). Slides were first incubated in 10% normal goat serum (Life Technologies, Carlsbad, CA) for 30 minutes, followed by 60 minutes with an anti-DNAJB9 rabbit polyclonal antibody (cat# HPA040967; Sigma-Aldrich) diluted to 1:50 in Background Reducing Diluent (Dako; Agilent Technologies, Santa Clara, CA). Next, slides were incubated for 60 minutes in a goat anti-rabbit IgG secondary antibody (Alexa Flour 568; Thermo Fischer Scientific) diluted to 1:200 in background reducing diluent. Slides were then incubated for another 30 minutes with anti–IgG-FITC rabbit polyclonal antibody (Dako; Agilent Technologies) diluted to 1:10 in background reducing diluent. Counterstain was performed using Hoechst 33342 (Life Technologies) for 10 minutes and slides were coverslipped using ProLong Gold antifade mounting media (Life Technologies). Financial support was provided by the Department of Laboratory Medicine and Pathology, Mayo Clinic (Rochester, MN). S.D. and M.P.A. contributed equally to this work. S.H.N. and P.J.K. are co-senior authors. See related editorial, “Glomerular Disease Pathology in the Era of Proteomics: From Pattern to Pathogenesis,” on pages 2–4. This article contains supplemental material online at http://jasn.asnjournals.org/lookup/suppl/doi:10.1681/ASN.2017030306/-/DCSupplemental.